For quite a while now the standard procedure around here was, groceries are here toss them in the pantry. This works if your pantry is a shelf, or you enjoy complete dependence on the grocery stores. This does not fit with the mentality of homesteading and self reliance. So we’re taking a different tack. I’ve added more shelves, organized and began to employ a database app to track the ins and outs from the pantry. The program that I have found is called Estorage. It is available on the apple store, and is about 4.00 or so. It allows you to create a catalog of all items stored with options to enter lots of additional information. What we have found after listing everything In the pantry is that we have put together quite a store. There are still holes however which we will ferret out over time. 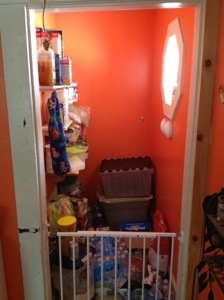 On the left is the pantry before the addition of shelves, and organization. On the right is the after effects. This is not hard. Do not be fooled by the hoards of people telling you that you must have ascertain shelf, or can tumbler etc… You don’t. The shelves that you see across the back wall literally took 15 minutes total to put up, at a cost of $0. That’s right I said 0. The wood was repurposed from a shipping crate. Anyone an, and should consider putting up some food, it just makes sense. You might also notice a familiar green tote. All of those supplies will not go bad, and do not take much space at all. Also that tote is ready to grab and go at a moments notice. 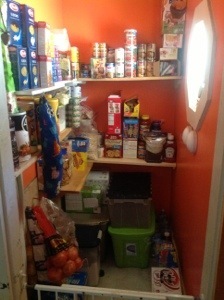 There is a great feeling that I really cannot describe to you that comes with having a pantry built. Your shelves look great and you can’t beat the price! Heading over to Google play to see if that storage app is out for android. Thanks for the inspiration. Glad to help, and thanks.